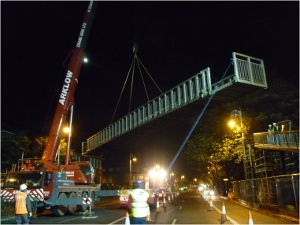 OCSC Engineers worked through the night with contractor and steel erector staff to supervise the putting in place of a new pedestrian bridge across the R105 at Fairview, Dublin last week. 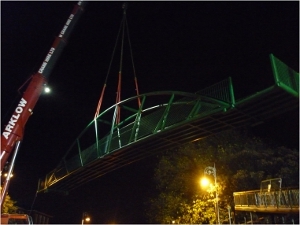 The new structure replaces an old pedestrian bridge which has been in place since the 1960’s. It crosses a busy 6-lane highway and was lifted into place overnight so as to minimise disruption to this busy thoroughfare. The new structure is a welcome addition to the local Fairview skyline and has been warmly welcomed by locals and commuters alike.